Cmde. Abhay Singh is a Research Fellow at the Military Affairs Centre in the Institute for Defence Studies and Analyses, New Delhi. 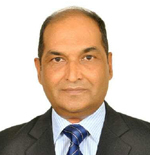 He is an Indian Navy veteran with extensive command and staff experience spanning 27 years. A surface warfare officer with a specialisation in Missile and Gunnery Warfare, he has commanded various naval platforms which include frontline frigate, submarine rescue & deep diving vessel, and fleet auxiliary. He has also served as Director (Military Affairs) in the Disarmament and International Security Division of the Ministry of External Affairs. Cmde. Singh is an alumnus of the Naval Academy, Defence Services Staff Course and Naval War College. He has an MSc (Defence and Strategic Studies) from the University of Chennai and an MPhil from Mumbai University. His publications include: “Maritime Exclusion Zone: Legal Perspectives and Strategic Option,” Maritime Affairs, Vol. 4, No. 1 (Summer 2008), 79–111; “Cross LOC Strike and India’s Reputation for Resolve”, IDSA Comment, October 21, 2016; “The Admiralty (Jurisdiction and Settlement of Maritime Claims) Bill 2016 – The Long Journey of an Important Maritime Legislation”, IDSA Comment, October 03, 2016.